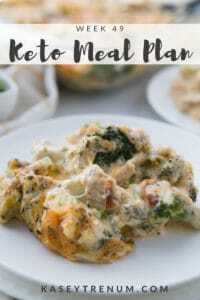 Keto Sausage & Egg Casserole Omelet is an easy and satisfying breakfast that can be made ahead for convenience. 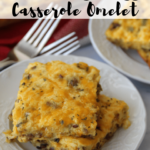 I love an easy breakfast casserole I can make ahead at the beginning of the week that covers several days for us. Having breakfast already prepared makes mornings so much easier plus, there is little mess to clean, which is always a plus. All I have to do is pop a serving in the microwave and breakfast for my kids is done. 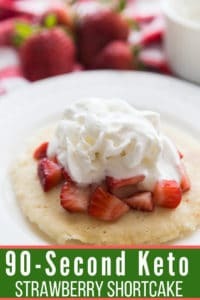 As a homeschool momma, I’d rather spend less time at breakfast and finish our day a few minutes earlier in the afternoon. My hubby can grab a serving to enjoy before he leaves for work in the morning. 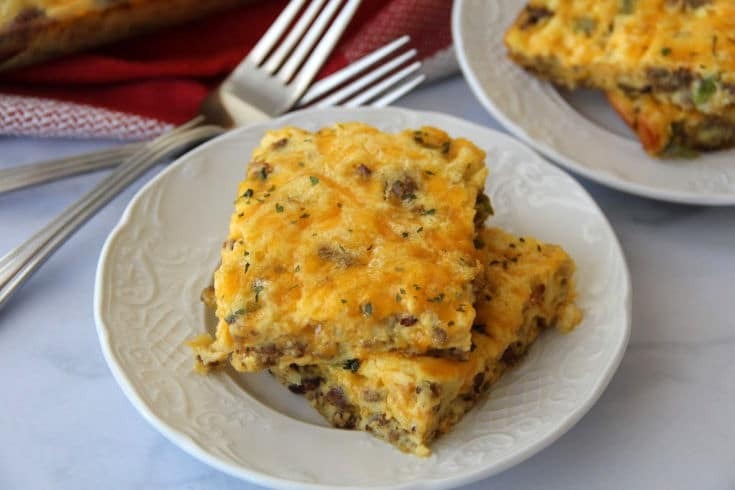 Once I make the Sausage & Egg Casserole Omelet I cut it up into individual servings and store in a container in the fridge so that it doesn’t take up so much shelf space. Brown, the breakfast sausage about halfway, then add the veggies and continue browning. You could also add chopped mushrooms or spinach if desired. 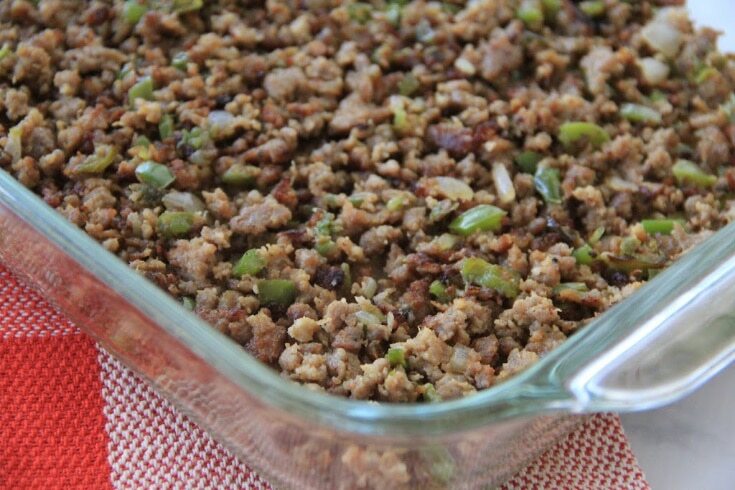 I pour the drained sausage in a 9 X 13 casserole dish. If you had rather you could mix it up with all the other ingredients then pour it in the casserole dish. I always use freshly grated cheese to avoid additives that are included in preshredded. I think the freshly shredded takes so much better. Omelets are always a challenge for me to keep in one piece. 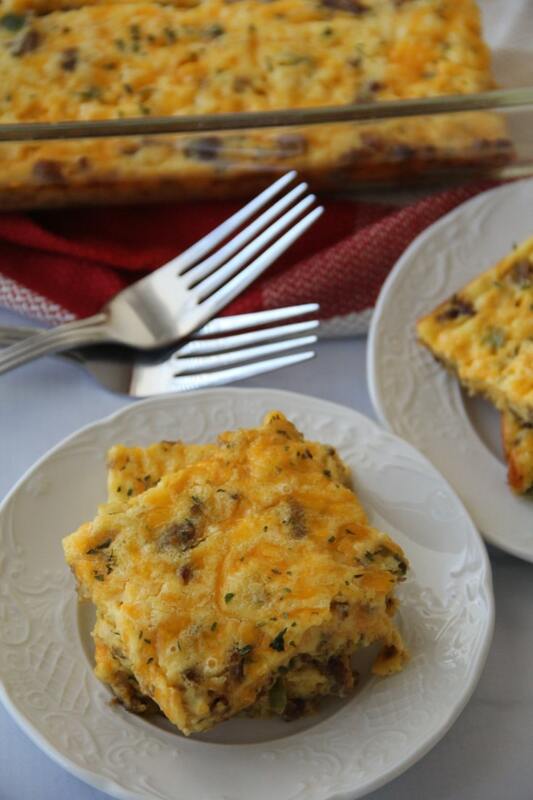 This Sausage & Egg Casserole Omelet is the best of both worlds. 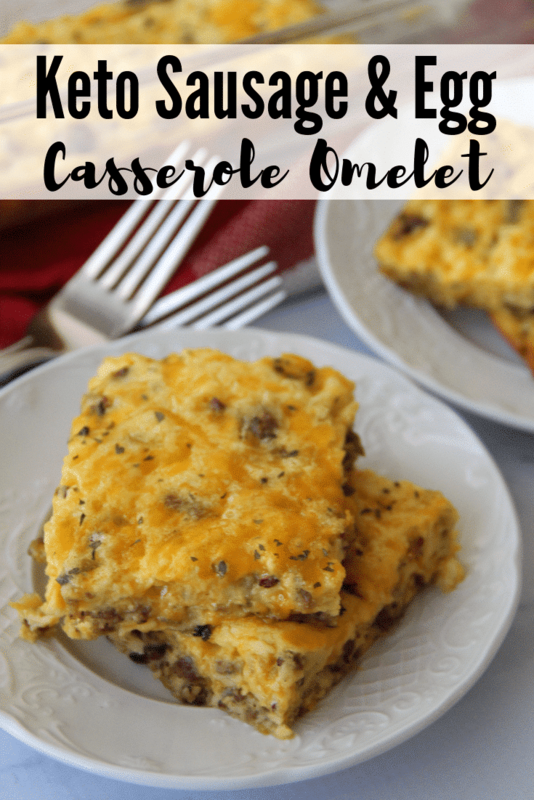 This Low Carb Sausage & Egg Casserole Omelet is the perfect breakfast with only two net carbs per serving. 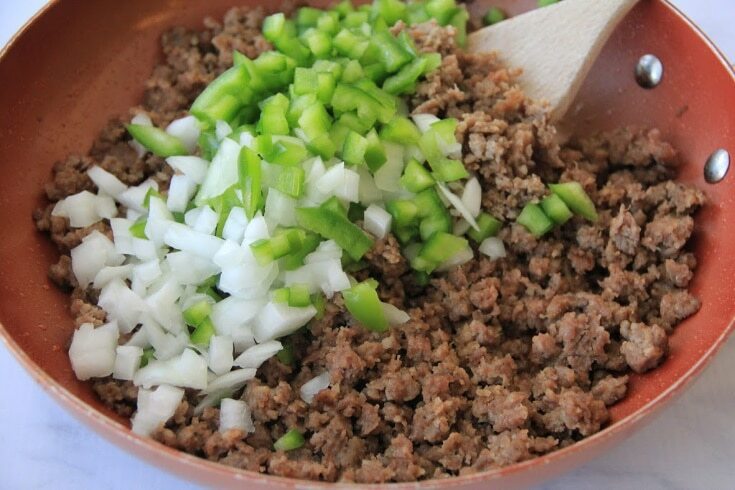 In a skillet brown sausage until it is halfway done then add the chopped green bell pepper and chopped onion. Next, drain the excess grease. 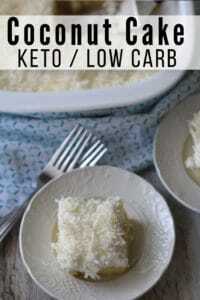 In a bowl combine all other ingredients reserving 1/4 cup of the cheese to sprinkle on top. 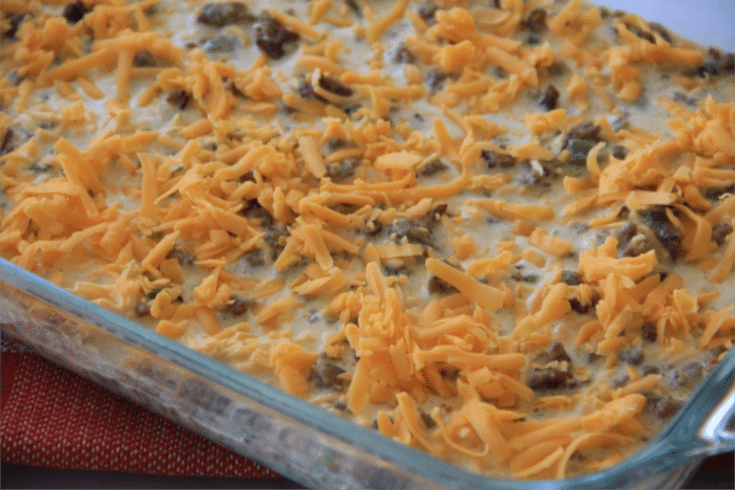 Sprinkle the reserved cheese on top then pop the casserole dish in the oven and bake for 20 to 23 minutes. Enjoy! I believe there’s a typo in the amount of heavy cream, I only used 3/4 of a cup. Also, it seems that the baking time needs to be a little longer. I had to bake it 10 minutes longer than the recipe said (my oven temp is accurate). I’ve enjoyed several of your recipes, they are yummy! Ahhh….yes. That has been corrected. I tested this baking time in my oven 3 times, but every oven bakes differently. 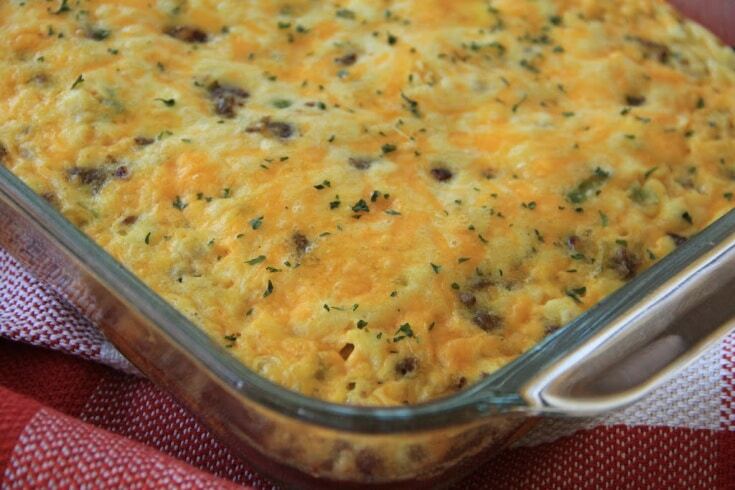 Also, different people prefer a different level of doneness with egg casseroles. It’s always best to adjust to your liking and oven temperature as you did. Thanks! I’m glad you have enjoyed the recipes you’ve prepared. Made your meatloaf last night & we LOVED it..absolutely the tastiest I have ever made…a real winner! Wow! So glad you enjoyed it! I don’t mind repetitive eating..at all. I would love to find a few recipes that I could make ahead of time and eat for a few days..that would be wonderful! I’m not a big fan of red meat.. I can tolerate turkey bacon, ground turkey and chicken…and maybe some fish. I am disabled and live on disability and do not have the extra money to pay for a meal plan..but I do need to lose 30lbs. I am a member of a local gym. Any suggestions for online resources that might be helpful to me? 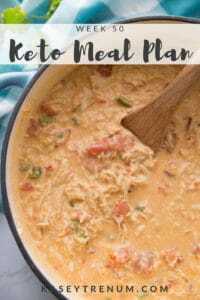 Here is a link to 40 previous meal plans that are all free that you can pick and choose what sounds good to you. There is no shopping list as it’s just not something I have time to do each week and many people already have basics in their pantry. 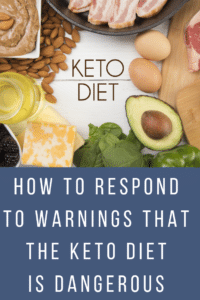 You may be able to find some things on Pinterest too. The number of servings is listed in all of the recipe cards. Awesome! THanks so much for your kind words. Can you freeze ahead ot time and then just put in oven or beat to make one day ahaed? I’m not sure as I’ve only made it as is. I would think you could. It will be grainy as it won’t dissolve. You can put the granular in a blender or magic bullet and turn it into powdered.